In my blog entry from last week, I gave a brief description of the Georgia O’Keeffe Museum’s newest exhibition, Modernism Made in New Mexico, and much of the emphasis of my post was placed on the influence of the landscape of New Mexico on the Modernists who visited and worked in the state during the first several decades of the twentieth century. While the artists presented in the exhibition took a substantial amount of inspiration from the natural landforms of New Mexico, other aspects of the region’s aesthetic qualities also are featured as notably influential subjects for Modernist painters. One of the most prominently featured is that of architecture. New Mexico boasts a unique variety of architecture that is influenced by both colonial Spanish and Native American design elements. These qualities would make it appear particularly exotic to artists whose origins were in the metropolises of the northeastern United States, which are designed around modern, utilitarian construction methods. In this respect, New Mexico’s architecture likely appeared just as striking and inspirational to eastern Modernists as the landscapes that surround it. One of the works included in Modernism Made in New Mexico that highlights the fascination of artists with New Mexican building aesthetics is Jozef Bakos’s 1935 oil painting of El Santuario de Chimayo. 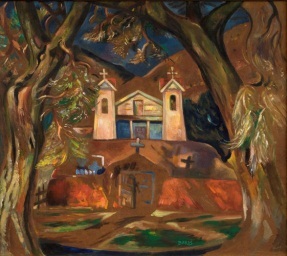 Feature Photo: Jozef Bakos, El Santuario de Chimayo, 1935, Oil on Masonite, Loan, Private collection. The painting depicts the famed Santuario in Chimayo, New Mexico, which lies approximately thirty miles north of Santa Fe. The Santuario is built on the site where a devout member of the Catholic Penitente order, whose faith is centered on the passion of Jesus Christ, is said to have discovered a miraculous crucifix that is now displayed in the main chamber of the Santuario. Next to the room that houses the crucifix is a smaller room with a tiny well in its stone floor that provides pilgrims with access to the holy soil which the crucifix, known as Our Lord of Esquipulas, is said to have been excavated from. This soil is also believed to have miraculous healing powers for those who come into contact with it. 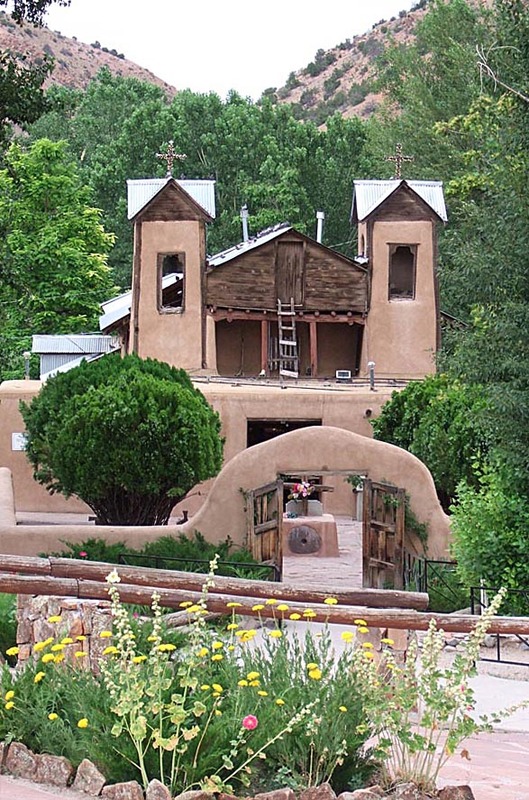 El Santuario de Chimayo is a moving location for non-believers and pilgrims alike, as it sits on the winding bank of the Santa Cruz River, which provides irrigation to the meticulously maintained gardens and shrines that are arranged throughout the peaceful grounds. Most poignantly, one shrine wall is completely enveloped with photographs of loved ones left by pilgrims who come to offer prayers, while the wall adjacent to it has become a resting place for crutches, canes, and other aids for physical maladies that have been left behind by pilgrims supposedly healed by the miraculous soil housed in the Santuario. The aesthetic centerpiece of the grounds, however, is undoubtedly the Santuario structure itself, which is composed of a central, gabled roof that is flanked on either side by adobe steeples, each with a wooden cross placed at the apex of its roof. The nineteenth century structure is composed completely of adobe and wood, providing a wonderful glimpse into the pre-modern colonial architecture of the southwest. Inside, the Santurio is even more breathtaking, with a vibrantly colored central altar, and a number of retabolos and bultos, terms which refer to painted and sculpted religious icons, respectively. El Santuario de Chimayo, photograph by Andrea Stawitcke. Clearly, Bakos was inspired by the spiritual energy of the Santuario, framing it as the central point of focus in his painting by placing it between two large, abstracted trees that sit in the foreground and establish a vertical composition for the scene that is paralleled by the Santuario’s twin steeples. This verticality is balanced by the horizontal wall that runs in front of the structure as well as the portal of the building, which is painted in a contrasting blue against the structure’s brown and tan adobe walls. Finally, the mountain peaks behind the Sanutario run downward from the sides of the canvas to the center on diagonal axes, creating the ultimate sense of evenness between vertical and horizontal forms in the painting. In true modernist fashion, Bakos has envisioned the physical features of the scene as blurred, abstract shapes which he arranges to create a satisfyingly balanced aesthetic experience for his viewer. The Santuario structure stands as the main subject of the painting, this designation signified by its central placement and the structuring of the rest of the painting’s shapes around its basic architectural features. Additionally, the Santuario is emphasized by Bakos’s lightening of the colors that characterize its roof and steeples. He uses lighter shades of beige and tan to distinguish the building from the darker brown and red colors that tint the wall and ground in front of the structure as well as the mountains behind it. The building appears even lighter than the green accents on the trees in the foreground and the dark blue sky at the very back. Ultimately, Bakos’s painting exists as a conglomeration of shapes based around the architecture of the Santuario that sits at its center. These shapes are distinguished from one another through his use of contrasting color tones, but they are arranged in such a way that the vertical and horizontal forces they excerpt on the scene are present in equal measure. In this way, Bakos captures the natural energy of the Santuario, as it is a place of quiet tranquility that exists in a state of static balance. Just like the other Modernists exhibited in Modernism Made in New Mexico, the artist employs shape as a central device in his conveyance of the aura of the place he is painting. In the case of El Santuario de Chimayo, he uses shapes to create an optical balance that captures the rigid yet gentle stability of one of New Mexico’s most inspiring architectural sites. Jozef Bakos, El Santuario deChimayo on loan to the Georgia O’Keeffe Museum from a private collection. El Santuario de Chimayo Image by Andrea Stawitcke.